Looking for a Unique Billiard Set? Let EPCO deliver on our mission of Quality, Precision and Style with your own personalized twist! Have your name, initials, company/organization name or logo etc. added inside to create your Crystal-Clear one of a kind set! 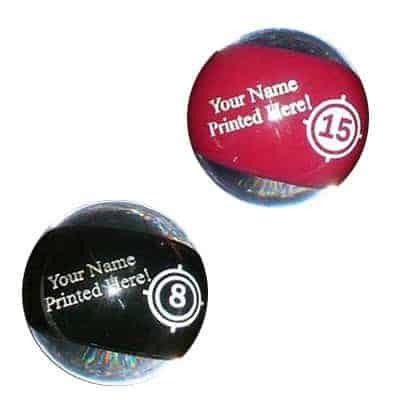 * All balls in the set are Regulation Size, however, they weigh 4 ½ ounces which is slightly less than regulation weight – the action on the table is just the same as the regulation weight balls.